Your guests' first impression of your business will have a profound impact on its success. BlackHawk Janitorial Services LLC takes commercial cleaning in Atlanta Georgia seriously. A clean, well-organized environment keeps businesses running smoothly. The floors should shine. The restrooms should not only look and smell clean, but also be properly sanitized to keep employees healthy. Reception and common areas should always be prepared to welcome guests. A clean office will keep your customers coming back. Here at BlackHawk Janitorial Services LLC, we understand that every professional building has unique needs. 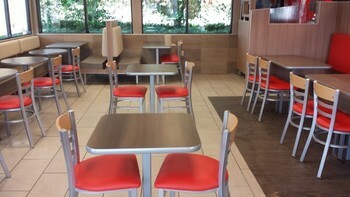 That’s why we customize all of our Atlanta commercial cleaning and maintenance services. Exceeding the expectations of your business, BlackHawk Janitorial Services LLC takes pride in our Atlanta commercial cleaning offerings, and are committed to meeting your needs. We will help your business promote a professional image by paying attention to every detail of your Atlanta commercial building. Whether you’re looking for daily, weekly or monthly commercial cleaning for your building, BlackHawk Janitorial Services LLC will customize a cleaning schedule that works best for your customers and employees. For 30 years, our professional cleaning team has helped improve the look of many professional offices. We are committed to providing the top quality cleaning that your business deserves. Our cleaning technicians are thoroughly screened and professionally trained, so you always have peace of mind knowing your Atlanta commercial cleaning process will truly be a worry-free experience for you. And more! Call BlackHawk Janitorial Services LLC today for a free commercial cleaning quote. As a trusted Atlanta commercial cleaner, you can count on BlackHawk Janitorial Services LLC to handle every job quickly and professionally. We have over 30 years experience exceeding the expectations of Atlanta businesses. 5★★★★★ - "We appreciate Blackhawk Janitorial's dedication, excellent service provided to our facility. Blackhawk Janitorial has been doing a wonderful job and we are happy with their services. I would recommend Blackhawk Janitorial to any business looking to get professional cleaning services. William the owner is very professional, always on time, and pleasant. 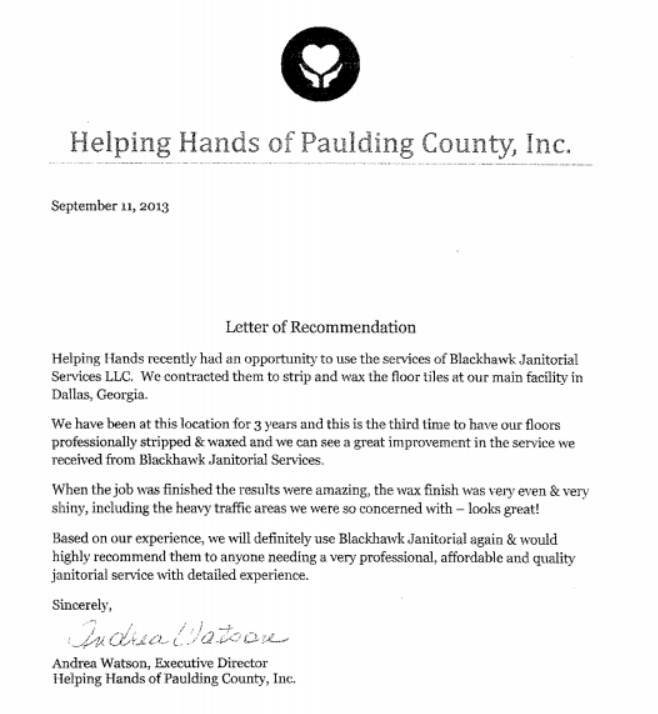 Thank you Blackhawk Janitorial"
"William did a great job and you all were excellent to deal with. You are still the cleaners that we will call when in the Atlanta area and I thank you for the services you provided." 5★★★★★ - "Very happy with out floors! The finished looks better than we hoped. Great job. Will use Blackhawk again. Very professional." 5★★★★★ - "turned an old floor back into a new one practically...Thanks, Blackhawk!" 5★★★★★ - "This company is amazing. The machines they use keep our carpets clean and fresh. They get the job done in a timely manner and the wax they use always has our laundry floors feeling smooth and looking crystal clear. It's like staring into a mirror. 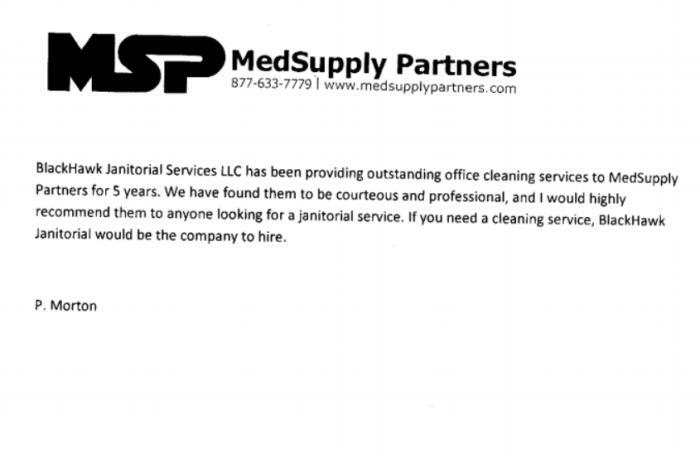 My property has been using this company for close to a year and I'm looking forward to our one-year anniversary cleaning." 5★★★★★ - "We've been working regularly with Blackhawk to take care of our offices in a historic building for over a year. They are professional, reliable and our place always looks great! William also takes care of those occasional things as part of the regular service. 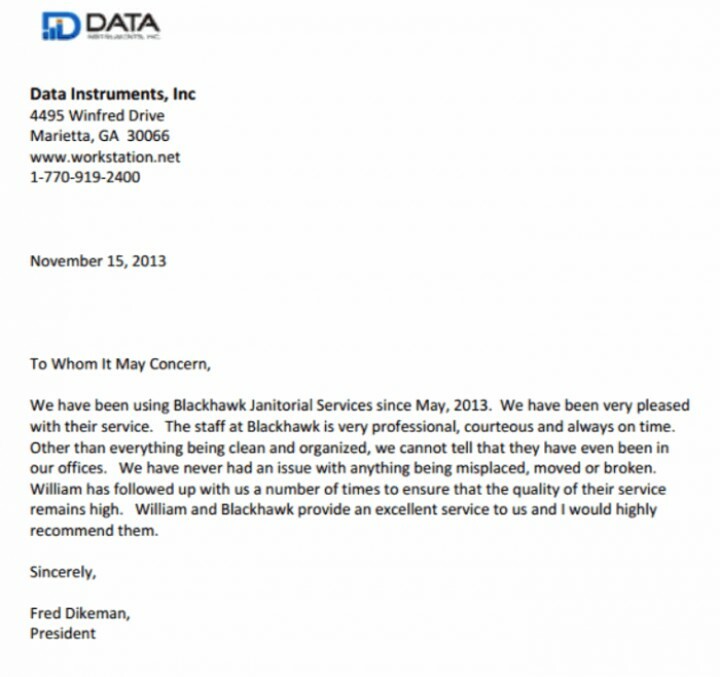 We're really happy working with Blackhawk. " 5★★★★★ - "They are always prompt and do a great job for us! They are also understanding that we run a business and sometimes ask they to come at weird times. We will continue to be clients of them for a long time!" 5★★★★★ - "Floors looked great! Awesome job! Friendly, courteous, and prompt!" 5★★★★★ - "Amazing job. Looks brand new!" 5★★★★★ - "Very good job. Would recommend on future jobs." 5★★★★★ - "William was one of the most professional cleaning services I have ever dealt with. I would recommend him to anyone."